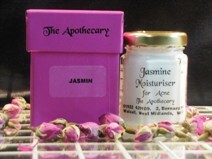 Jasmin is a truly exotic fragrace. Known as the king of oils, it has a rich, pungent scent which is just intoxicating. There is an enchanting ancient Indian myth, that I love, of a beautiful princess who fell deeply in love with the sun god Surya-Deva. Tragically, according to the myth, the sun god rejected the princess’s love and she was heartbroken. Driven by her desolation into madness, she killed herself, no longer able to see a reason to live. 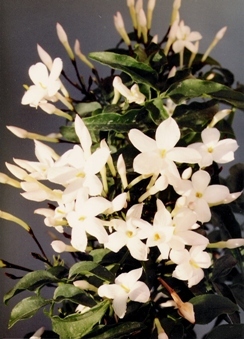 From her ashes that were scattered to the ground, a most beautiful jasmine bush grew. 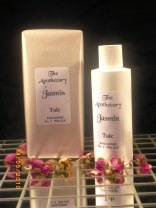 As a reminder to the sun-god that he was responsible for the princesses death the jasmine flower would forever only open and release her perfume at night. The jasmine absolute essential oil is prohitively expensive, but when you consider how it is made you can see why, I suppose. The flowers are collected at night and are left on cotton cloths soaked in olive oil until all the oil is extracted. The olive oil is then soaked in spirits. It must take days!! As an aromatherapy treatment I would describe it as "the other end of the spectrum" to rose. Where Rose is reminiscent of beautiful sunny days, jasmin is sultry evenings when its flowers fragrance are at their most tantalizing. Where the English Rose is a pale, cool complexion, this oil is a hot dark one. Where Rose is romantic love, then it is seductive and enticing. As you would guess it is deliciously aphrodisiac, but it is also one of the most important oils in the treatment of anxiety and even depression. It is reputed to be able to help impotence and also frigidity. How true that is I am not sure but I would definately say it kind of lifts you out of yourself in a way. It makes you a bit light headed and a bit nicely giddy so I can see that it may kind of separate you emotionally from these anxieties. It is certainly deliciously sensual. It is recommended by many sources for childbirth as it strengthens contractions. I would have to say I would only agree if you were struggling with weak ones and labour was not progressing. Otherwise it is simply too potent in my opinion. Having said that it does help to tone the uterus to expel the placenta so this is definately a help. In fact I think this is worth considering for buying a gift for a new mum, beautiful for that first bath after the birth. It being a uterine tonic, though, please do not use this range in pregnancy. 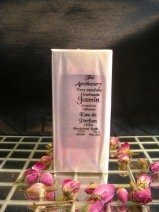 It is a wonderful treatment for hot, dry and sensitive skins. In particular acne or dark olive complexions. I can also say that I have never found a treatment like it for fading and healing scarring - another reason why it is so effective for acne. This is the ultimate time alone treat. But remember how essential oils work, lie in the bath for just 20 minutes and you will start to feel all the oil's benefits. The utimate polish to your body preparations. There aren't any finer talcs on the market, I don't think. Beautiful handmade soaps are made from our own colognes and are blended with coconut and olive oil. They really do leave your skin exceptionally soft. Well let your imagination run riot. Of course it has all those sizzling aphrodisiac effects, but consider this a waythat you can absorb the essential oils little by little, day by day. A lovely way to lift your mood a little but also to start feeling an inner sensuality again. The antibiotic qualities heal the infection quite quickly so it attacks the root cause. The moisturiser is a hydrogenating baseso it won't lather on loads of oil and grease, it just gently cools all that heat down with the water in it. What an exquisite way to take care of the one you love. Please note, there are some conditions that mean that massage is not advisable. 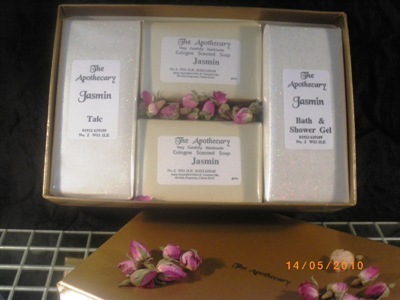 We make many products in other flowers apart from jasmin...Click here. 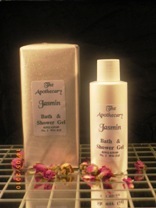 Back to aromatherapy-natural-products.com home page.